Most people experience foot pain at some point in their lives, and it can be caused by a variety of foot conditions. One of the common culprits is a heel spur. Read on to learn more about what heel spurs are, what causes them, and how they can be treated. A heel spur is a protrusion of bony growth on the bottom of the heel bone (calcaneus). It is formed by deposits of calcium. In many cases, heel spurs are visible on an x-ray of the foot. In fact, heel spurs can protrude from the heel by as much as half an inch. Not every heel spur is visible on an x-ray, though. Sometimes, the symptoms of heel spurs are present, but the x-ray does not demonstrate a noticeable protrusion. When symptoms of heel spurs are present but a spur cannot be visualized through radiology, a diagnosis of heel spur syndrome is made. A heel spur can be present without causing pain – even if the spur is large enough to appear on an x-ray. However, heel spurs do cause pain for many people. They often are present in conjunction with another condition of the foot, such as plantar fasciitis. Plantar fasciitis is the inflammation of the connective tissue that joins the heel with the ball of the foot. Heel spurs occur when there is a buildup of calcium on the bottom of the heel. This buildup develops over an extended period of time. It can be triggered by straining the ligaments and muscles in the foot or stretching the plantar fascia. Athletes are particularly prone to developing heel spurs, especially those whose sport involves a lot of running or jumping. Spending long periods of time standing. It is possible to have heel spurs without experiencing any symptoms. 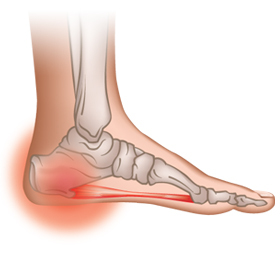 Often, the pain related to a heel spur occurs intermittently. It tends to be worst when a person first wakes up and stands up in the morning. After moving about a bit, the pain may go away. It can then return after a period of inactivity. The pain can also be exacerbated by more strenuous activity, like running. However, rest is not always the best way to deal with heel spurs, due in part to their connection with plantar fasciitis. The plantar fascia tightens when the feet are at rest. When you stand up after a period of rest, the plantar fascia suddenly must stretch out. Over time, it loosens up, and the pain goes away. Moderate levels of activity are typically best for heel spurs. If you have a heel spur, your doctor/pharmacist might advise you to take over-the-counter anti-inflammatory medications, to address the pain. Many patients benefit from physical therapy or at-home stretching exercises, too. The best treatment for plantar fasciitis and heel spurs is supportive, cushioned footwear, along with a custom arch support. You should have your feet assessed by a professional and consider using these, which may help to prevent pain instead of reacting to pain after you have it. If you have been diagnosed with a heel spur, or if you have any type of heel pain, visit Foot Solutions in your area. We can custom fit you with shoes and arch supports that will help to minimize your pain and make your daily activities comfortable again. To learn more about the options available for treating your foot pain, call Foot Solutions UK.